30% of QNAP users choose to build RAID 5 array for their NAS for higher data protection, better system performance and more available storage space. The TS-328 is QNAP's first 3-bay NAS, allowing you to build a RAID 5 array on your NAS with the fewest disks. Powered by a Realtek quad-core RTD1296 processor, the TS-328 features a minimalist design that easily fits into your home or commercial space. With a variety of multimedia applications, transcoding capabilities and cross-device file backup and synchronization, the TS-328 provides a highly cost-effective solution for storage, backup, file management, and sharing. With just three disks you can build a secure RAID 5 array on the TS-328. This provides optimized storage capacity and protection against one disk failing. Supports H.264/H.265 hardware decoding and transcoding, providing a smoother video viewing experience. Snapshots fully record system status and data (including metadata). If files are accidentally deleted or modified, you can quickly restore the data with snapshots. Qfiling automates file organization, greatly improving work efficiency. Hybrid Backup Sync consolidates backup and sync tasks to a single app; Qsync is an easy-to-use real-time file sync service for computers and mobile devices. Take photos or record videos using Qphoto on your mobile device and they will be automatically uploaded to the TS-328. You may have lots of photos or videos spread across devices, which can be hard to manage and back up. With the TS-328, you can centrally backup and manage all your files and easily share them with others. With the new version of File Station (QTS 4.3.4), you can directly access the photos and videos on your mobile device by connecting it to the TS-328 via USB. You can even use the Qphoto mobile app to take photos or record videos and directly upload them to the TS-328 for greater protection to save the storage space on the mobile device. The TS-328 is powered by a Realtek RTD1296 quad-core 1.4 GHz processor with 2GB DDR4 memory. It provides two 1GbE ports and SATA 6Gb/s disk drives, delivering up to 225 MB/s read/write speeds. The TS-328 also has two USB 3.0 and one USB 2.0 ports, allowing you to easily transfer large media files across devices via USB connection. Snapshots help protect your data by fully recording the NAS system state and the metadata. If an error occurs, you can use snapshots to quickly restore the system to its normal state. QNAP snapshots are block-based and only record the changed data. Not only does this save storage space but also reduces the time required to back up and restore data. The TS-328 supports 4K H.264/H.265 hardware decoding and real-time transcoding , allowing you to convert videos to universal file formats that can be smoothly played on multiple devices*. Therefore, you can easily share movies or travel videos saved on your NAS to your family and friends via shared links and they can enjoy watching the videos smoothly anytime and anywhere. *The TS-328's hardware provides H.264 /H.265 10-bit hardware decoding, encoding and transcoding capabilities. However, playback quality may vary due to factors including playback software, file formats, system usage, and available bandwidth. The TS-328 supports SSD caching to greatly boost the IOPS performance of storage volumes and increase operational efficiency. It is perfect for improving the overall workflow of IOPS-demanding applications and allows the best of both cost and performance by combining SSDs with HDDs. QNAP IFTTT Agent integrates the popular web automation service IFTTT (If This Then That), allowing you to create a near-unlimited number of automated workflows. Simply connect your IFTTT account with your TS-328 and set triggers and actions. For example, if you set a trigger as "Any new photo on the phone" and the action as "Upload the photo to QNAP NAS," then all the photos taken using your phone will be automatically uploaded to TS-328. The app-driven QTS operating system provides solutions for simplifying file backup, management, search, and more. With File Station you can view your NAS files and access files from USB storage devices, the OCR Converter allows you to extract text from images, Qfiling helps automate file organization, and Qsirch helps quickly find files. QNAP NAS now supports the popular 360-degree panorama recording format! By clicking the 360-degree panorama display button, these photos and videos will be displayed as 360-degree panorama media files. The QNAP mobile apps Qfile, Qphoto and Qvideo also support 360-degree format viewing. File Station brings conventional desktop-style file operations to web browsers, allowing you to upload, download, and manage files on your TS-328 wherever there is an internet connection. Supporting file extraction, folder creation, and smart search for files and folders, File Station also allows you to easily share files via unique URLs protected with reliable security features, SSL and password options. You can even directly browse and transfer files between the TS-328 and public cloud services like Google Drive™, Dropbox®, Microsoft® OneDrive, Box®, Yandex® Disk and Amazon® Drive, open office files directly with a Google Chrome™ office extension, and also view your files on Google Docs™ or Office Online™. 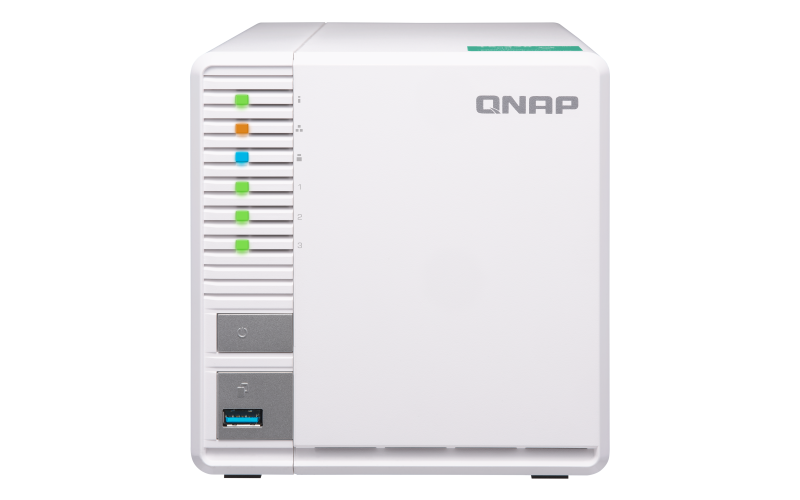 Download the QNAP TS-328 Specifications (PDF). QNAPWorks.com.au is a division of Virtual Graffiti Australia Pty Limited, an authorised QNAP Networks reseller.